Plans for a two-phase $175 million Griffith Park expansion project for The Autry National Center are dead. The expansion was slated to increase galleries, classrooms and collection storage areas. Architect and preservationist Brenda Levin, founder and principal of Levin & Associates Architects had presented design schema (pictured above) last year, when the expansion had a (relatively) more modest $100 million price tag. However, the city wanted to require the Autry "to make a legally binding commitment to support the Southwest Museum as a fully functioning art institution in perpetuity" according to the LA Times. The Autry declined, stating in a letter to the City Council "that such a commitment would be irresponsible and that it is withdrawing its proposal." The Autry is now planning to convert storage space into galleries and has promised to continue to care for the Southwest's Native American collection and building. Because you are a valued friend of the Autry National Center whose loyal support is vital to our institution, I want to make sure that you learn directly from us about a recent decision of our Trustees. Today, with great reluctance, we informed the City's Board of Referred Powers that we are withdrawing our proposal to build an expansion of the Autry's building in Griffith Park. It has become clear to us that if we were to go on seeking approval for our proposal, our plans would be subjected to expensive and virtually endless official delays, while the Autry itself would be under constant threat of costly litigation. Given these circumstances, we have concluded that any further attempt to proceed with the expansion would be an ill-advised diversion of our financial resources, and an insupportable distraction from our work in serving the community. We want you to know that this difficult decision follows upon the latest delay in the political process for approving the expansion. We have been informed that the Board of Referred Powers has postponed ruling on our proposal indefinitely, until such time as we contract to operate our Mt. Washington campus solely as a freestanding facility for the Southwest Museum. No responsible Board of Trustees could agree to this commitment. If imposed on us, it would return the Mt. Washington campus to a model of operation that has been conclusively proved to be financially destructive and curatorially unviable. We cannot and must not go backward-and so, having made the only feasible decision, we will now move forward on two fronts. On the first front, at Griffith Park, we will be developing fresh options for creating an inclusive and exciting experience within the existing facility. To some extent, this process has already begun through our ambitious schedule of exhibitions and programs. This fall, we will present The Art of Native American Basketry, revealing for the first time more than 250 baskets from the premier collection of the Southwest Museum. In spring 2010 we will present Home Lands: How Women Made the West, which will use historic artifacts, art, photographs, and biographies of individual women to show how women have been at the heart of the West across cultures and over time. We will continue to develop the Griffith Park building into a new treasure for Los Angeles, honoring all the diverse peoples of the American West. Meanwhile, on the second front, we are working on an exciting and sustainable plan for our Mt. Washington campus. Since 2003, we have invested approximately $7.5 million in conserving the Southwest Museum collections that have been housed there and in repairing and stabilizing the landmark building. While this work continues, we are studying how to transform the Mt. Washington campus into a multi-use educational and cultural center, with publicly accessible exhibitions and collections from the Southwest Museum at its core. 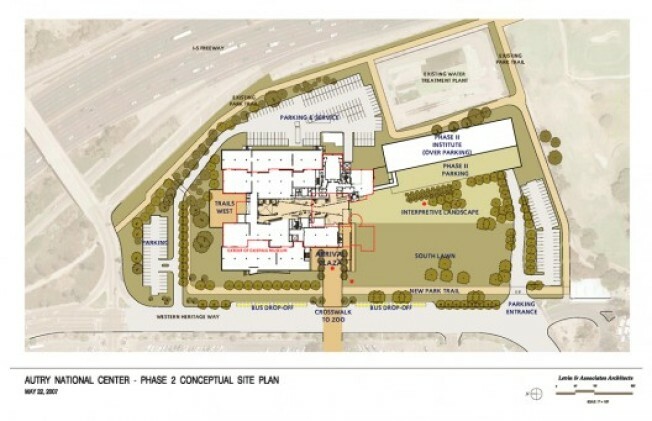 The center would also incorporate classes for all ages, conducted with partner institutions; an archaeology study center; research facilities; and space for cultural activities of Native American communities. An institution is more than its buildings. It is a shared vision. We feel confident that we will realize our vision of a nationally recognized Autry National Center-one that will celebrate the American West and explore the interactions of all of its cultures and peoples. Should you be interested, a copy of the letter we sent to the Board of Referred Powers is posted on our website, www.autrynationalcenter.org. We are deeply grateful to you, as always, for your understanding and support. We look forward to sharing our plans with you as they evolve.